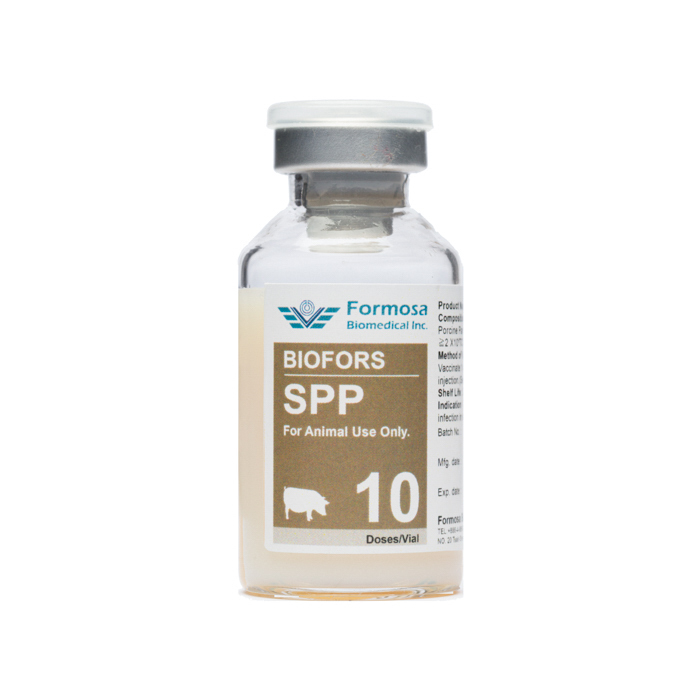 BIOFORS SPP contains inactivated Porcine Parvovirus (PPV) 90HS-SK Strain. PPV 90HS-SK was amplified in cell cultures and harvested. Harvested virus suspension was inactivated, and oil adjuvant was subsequently added. The vaccine has a physical appearance of milky white oil emulsion. Prevention of Porcine Parvovirus infection in pigs. Mix thoroughly before use. Administer 1 dose (2.0 mL) to each pig via intramuscular injection. Sows: administer 1st vaccination of 1 dose at 8-10 weeks prior to breeding and administer 2nd vaccination of 1 dose 4 weeks post-1st vaccination. Store in a dark place at 2 to 8°C. Do not freeze. ·Recover to room temperature before use; Shake well to mix thoroughly before use. Protect from direct sunlight. ·Use vaccination equipment sterilized in boiling water or by autoclaving. Do not sterilize with alcohol instead. Prior to vaccination, sterilize vaccination site with 70% alcohol. ·Do not save unused vaccines for later use. Sterilize unused vaccines and vaccines containers by autoclaving before disposal.